The bottom line is that there are still buyers in the market at Christmas and it is only at this time of year that they have the time to spend looking at properties. If you’re selling for whatever reason during this period there are two decisions you need to make: the choice of agent and whether or not to decorate your home. Apart from all of the normal criteria, the choice of agent will come down to whether their office is open, operating hours and staffing levels. You also need to know what is their level of advertising and marketing activity during this period. Then there’s the question of decorations and the general presentation of your home. Consider that your potential buyers come pre-packaged with biases and prejudices. They may not even celebrate the traditional Christmas as you know it or, if they do, they may be offended by the non religious icons we have come to associate with the season. Why give them more information than they need to know about you? By not decorating, you are protecting your privacy during home showings. You are also making your home feel more spacious without blocking pathways. When buyers enter your home, you want them to imagine putting their own furniture in each room, making it theirs, and they can’t do that if your holiday decorations dominate the stage. But what if the kids demand decorations? If you must decorate keep it to a minimum. Don’t block or cover up important selling features such as fireplace mantels, stairs, stained-glass windows. Tone down the size of tree. In place of a two metre tree, try decorating a table-top, one metre version. Stack wrapped presents in a closet or in one corner. Use more splashes of red than green because red is an emotionally appealing colour. Resist the urge to hang banners. 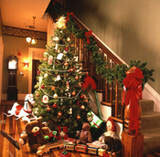 Use greenery instead such as evergreen or rosemary garlands. Set a plate of cookies on the counter, next to festive paper napkins for guests. Simmer spicy apple cider on the stove, and set out cups and a ladle. Generally, look to ways to use Christmas cheer to your advantage to generate a homely, lived in and loved feel about your property. Previous PostExpress sale for MudgeeNext PostHoliday homes – bliss or burden?